The clock was ticking, the guard began to change as star after star began to fade into the background but an ever present constant in the boxing hemisphere, Manny Pacquiao, was determined to shift the sands of time back into his favour last weekend as he faced Lucas Matthysse, in Malaysia, for yet another world title. “He’s too old”, the doubters said. “Matthysse has too much power”, cried the naysayers. “Getting rid of Roach was a mistake”, echoed those who questioned Pac Man. He paid no attention to the script, setting about what can only be described as a demolition job in crushing the Argentine in a manner akin to taking a hammer to a peanut. Matthysse landed a fair few half-decent punches but never looked like carrying a realistic threat to the legacy of Pacquiao and was dropped time after time before the contest was waived off in the seventh round. What next for Pacquiao, then? Seems harsh to suggest in the immediate aftermath of such a scintillating performance – his first knockout victory since 2009 – but retirement does seem to be a genuine option for the Filipino with the huge money making fights seemingly few and far between and with increasingly more risk to the ageing eight-weight world champion. The legacy of Pacquiao is solidified with the defining moment seeming to always be characterised by his series of fights with Juan Manuel Marquez so there’s no real need for the legendary fighter to carry on and risk becoming a Roy Jones Jr figure – albeit at a higher level and not against guys such as Bobby Gunn, Rodney Moore and that respective ilk. It’s not as though the 39 year old is without other options, boxing is very much a secondary focus as things stand in Pacquiao’s life with his priority being politics – elected as a senator in his home country, Pacquiao has a minimum term until 2022 which, in itself, makes preparing and organising fights relatively difficult. And let’s be clear this was probably Pacquiao’s best performance in six or seven years and there will always be the eternal question regarding his age and stamina – he proved his doubters wrong on Saturday but as we saw against Horn there is a distinct blueprint for beating Pacquiao and he’s ripe for the taking – so what better a night than to call it quits, retire as a world champion with plaudits aplenty. On the distinct polar opposite vein you could argue that because Pacquiao looked so good that in itself is all you need to back-up a call for him to continue – whether that’s papering up the cracks or not is something we’ll find out as and when future bouts happen – and an immediate fight that springs to mind is Amir Khan. Big in the States and big in the United Kingdom, Amir Khan is of an ideal profile for a mega fight with mega dollars to boot – it could also see Pacquiao in the United Kingdom for the first time though such is the statue of the guy we’d likely only see him for a press conference over here as opposed to the actual bout. Let’s not forget that the pair were scheduled to fight on April 23rd last year in the United Arab Emirates before the bout was called off but the desire to see the two meet in the ring has not dampened and if anything the flame has only burned brighter since Khan’s successful comeback. For Khan, who has more options than Kell Brook, this is a perfect opportunity to return to the world title scene and, in all honesty, it’s possibly the easiest champion he’d have to face in the division which is saying quite something. Amir has been there, too, he’s no stranger to these big fights and even though he lost, viciously, to Canelo, he put up a really good showing and there’s no doubt that against Pacquiao we could witness a tremendous, 50-50 fight with styles meshing. From that knockout loss to Canelo, mind, Pacquiao will be able to take immense confidence especially off the back of such a convincing beat-down of Lucas Matthysse. Couple in the notorious “glass chin” that Khan is often accused of having, the risk for Pacquiao would be relatively big but the reward would be phenomenal – Khan is possibly one of the biggest names that the Filipino could face whilst still possessing the tag as favourite. For me this is a fight that simply has to happen. Dropping down a weight division to super lightweight there is the possibility of facing Vasyl Lomachenko in yet another HUGE fight – Lomachenko needs no introduction so I won’t bother giving him one but it’s fair to say that a fight of this magnitude would invoke memories of Pacman’s contest with Mayweather and supersede the sport of boxing in becoming a sheer event for the pubic, fans or not. Loma is out until December at least following shoulder surgery and Pacquiao has hinted at wanting to drop back to super-lightweight for some time now so the build-up for the potential clash would no doubt capture the imagination of the boxing world. A clash with Lomachenko is the only bout that could have a positive impact on how we look back on Pacquiao’s career in 10 years – any other opponents are merely extra icing on the already lavishly decorated cake that are his 23 years as a professional boxer – but the Ukrainian provides a test that is unlike any other, a living legend, a walking Hall-of-Famer, a fighter who is, frankly, a freak of nature. Lomachenko would be the best opponent since Floyd Mayweather and there’s a reasonable argument to be made that he’d be the best opponent INCLUDING Floyd Mayweather, at least in retrospect, and would enter the fight as a favourite but if Pacquiao is determined to prove, once and for all, that he IS back then this is the sort of challenge he really needs to be looking at. The question that gets raised when you talk about this fight – potentially held at catchweight – is whether Manny really looked that good against Matthysse or if he was simply the least washed up of the two boxers as whilst it was a very accomplished performance you’d be hard pushed to say the Matthysse that turned up was on his A game. It’s a risk, yes, but is it a risk worth taking? I’ve opted for Jeff Horn to fill this last section although I was tempted to select Terence Crawford instead but Horn gets the edge because there is history in that encounter, we all know what happened in Australia and this would be a perfect opportunity to silence his critics from that night and prove it was a fluke loss. Over here in the United Kingdom endless repeats of their first fight were being shown on the broadcaster and, make no mistake, there wasn’t anything like the outrage shown in America with regards to the scoring but this is a fight that would sell, literally, to all four corners of the globe; you’ve got the Australian market who will be fervently routing for their home hero, the America’s backing Pacquiao and the Brit’s / European’s who love nothing more than a rematch with a bit of needle so in terms of marketability, this fight has it all. 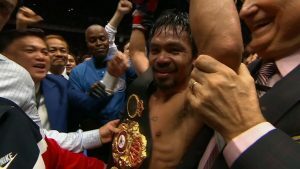 Redemption is a factor that can never be over-stated because looking back on his career, Pacquiao is not a man who will be satisfied with a perceived injustice if there was a possibility to put such a situation to bed and we’ve seen immediately after their contest in February last year that Pacquiao wanted the rematch so his self-belief is there. Horn, himself, is looking for an avenue back to the big time after getting soundly beaten by Crawford and the fight against Pacquiao is the instant avenue to go down because, for him, if he can pull of the “miracle” a second time then who can doubt him, immediately goes away all the criticism from their first encounter. A snagging point in this whole deal is the style of Horn, it’s not exactly conducive to a performance that will knock your socks off because even if Pacquiao is able to control every second of every round, he’s going to emerge with a bruised and bloodied face such is the aggressive nature of the Australian – the less sound about his leading head, the better – so whilst emotionally and sentimentally the fight may be seen as a win, stylistically and in terms of future stock, it’s hard to see Pacquiao emerge looking any sharper than the fight at the weekend. Time after time we’ve sat here and idolised about what could be next for such an icon of the sport and time after time he’s delivered the complete unexpected, the only thing we can ever take for granted with Manny Pacquiao is that he will never duck an opponent and he will always bring his all to a fight. What more could you ask for from an all-time great? Wherever he goes next, even if he doesn’t fight again, let’s just take a minute to bask in his shadows because for now, at least, this warrior is taking a one-man stand against the surge of young pretenders and, boy, is he holding his own when everyone and their dog seems to be writing him off. In boxing actions speak louder than words. 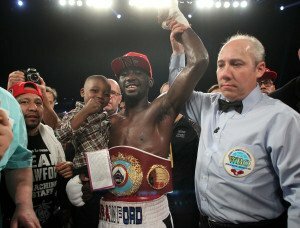 Once again, this was the case on Saturday night in Las Vegas, when Terence Crawford [ 33 -0 ] out classed, out boxed, out muscled, and took the Australian school teacher, back to school, with a dazzling display of skill, speed, and power, and dominance , that made the WBO champion look like a boxing novice. It was always going to be a real challenge for the Australian scrapper and this was apparent from the opening bell. Crawford was so dominant, from the 3rd round onwards, using his fast hands, and feet, ducking, weaving, switching , and exploding on to Horn, that left the champion with no answer, and it was clear from there, that we would have a new champion at welterweight. Every trainer, and promoter talks up their fighter, but I have to say , the talk from Jeff Horn’s trainer, Glenn Rushton , and promoter, Dean Lonergan were nothing more than absolute nonsense. I’m all for supporting, and boosting, even inspiring your fighter, and push him to be the best fighter he can be , but there is a limit to what you can tell him, to what the fighter knows already. Jeff Horn knows what he can do . Every man has their limitations. Comments from Rushton, like, “ I don’t want you to be a champion, I want you to be a legend “ Like I said, every man has their limitations. Horn’s promoter, Lonergan, a former rugby player for New Zealand, has said many things, before the fight, but his comments after the fight showed that this guy knows nothing about boxing, with his comments like, “ the fight was stopped too early, as Jeff would have come back , and who knows what would have happened in the 10th, 11th or 12th round” Lonergan is a fool. We all know what would have happened, had the referee , Robert Byrd, not stepped in to save Horn . There was still over 2 minutes to go in round 9 . Both Rushton and Lonergan talked way too much and are both delusional. Horn didn’t win a single round, never looked like troubling Crawford , and was out on his feet before the stoppage. Rushton is not too far behind Lonergan with comments like “ the stoppage was too quick. He got hurt more against Manny Pacquiao, and many of the rounds were very close” The guy knows nothing about boxing, or is delusional. 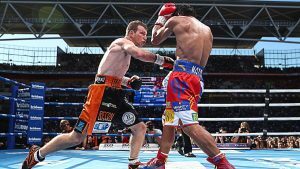 Jeff Horn had been elevated up the welterweight ladder , fighting hand picked guys in Australia, like Randall Bailey, Rico Mueller, and Ali Funeka, to win and get the chance of glory , and a crack at Manny Pacquiao’s WBO world title. Horn showed tremendous heart in a tough hard fight, and overcame the 9th round, to fight back , after the referee had told him that he thought he had taken enough punishment. Horn fought on, and won a very controversial result in his hometown of Brisbane. I have watched the fight 5 times, and Pacquiao was hard done by not to keep his belt. As Jeff Horn sat there with ice packs to his eyes, and his ear, and his wife nursing, and consoling him, there was already talk of a rematch by Lonergan, and Rushton. For these two fools, I will explain, a rematch is when a fight is so good, and thrilling for the fans, or it’s so close, and there is merit for the 2 fighters to get another chance of a clear victory. Gatti v Ward, Corrales v Castillo, Ali v Frazier, Holyfield v Bowe, Leonard v Hearns, and Marquez v Vasquez. Horn v Crawford should not be included . This fight was so one sided, that it put Horn back so far , that I hope he retires from the sport, or he will get damaged. Where does he go from here? I will say Horn will come back, and his team of Lonergan and Rushton will try and find their fighter an opponent that will assure him a win , just to get him back in the mix. The only problem with that is, who does he fight after that? Any of the top contenders, or world champions, Errol Spence Jnr, Danny Garcia, Keith Thurman, and Shawn Porter, will beat Jeff Horn. This was Horn’s first fight outside Australia, and he will be remembered for two things, which is losing badly to Crawford, and getting a hometown gift against Pacquiao. Fighting in America, at a world championship level, would be a challenge for him and his team. If Pacquiao gets past Lucas Matthysse in a couple of weeks, maybe Manny wants the rematch ? Horn failed on first attempt to make the championship weight, and there was more talk from his camp that he struggles to make 147, and he might move up. At 30 years of age, and not the fastest boxer at welterweight, moving up would be a mistake . Horn would be facing a long list of good fighters, in a very strong division, with champions like, Jamie Munguia, Jarrett Hurd, and Jermell Charlo. Actions do speak louder than words, but in this case, the writing is on the wall. Gary Todd is the proud author of his books on world champions and their workouts, “Workouts From Boxings Greatest Champs, volumes 1 and 2. “ he has been involved in all aspects in the sport of boxing for over 30 years . The Jeff Horn-Terence Crawford card on ESPN+ began at 9:30 PM Eastern Standard Time live from the MGM Grand in Las Vegas on Saturday night as the 23-1-0 Jose Pedraza faced the 23-2 Antonio Moran for the WBO Latino Lightweight Title. The first few rounds of the bout made for an exciting, see-saw affair, as both men fought energetically and with aggresion. Yet Moran got his nose busted, a war wound that got to look quite ugly as the fight wore on. There ended up being no stoppage. There wasn’t a knockdown to be found throughout the bout, either. It proved to be an entertaining match, though. Moran never gave up. Pedraza was simply stronger and was able to put his puches together better. Ultimately, Pedraza also proved to be the more energetic fighter as the bout wore on. The Puerto Rican ended up with the unanimous decision win and WBO Latino Lightweight Strap. It was time for the main event. The 32-0 Crawford stepped into the ring favored to beat the 18-0-1 Horn, even though Horn was the WBO World Welterweight Champion and had won that title by besting the great Manny Pacquiao – albeit by a highly controversial decision. For Crawford entered the weekend widely regarded as one of the best practitioners in the entire sport. He might have been moving up in weight to face Horn, but it was Crawford who boxing’s writers and analysts expected to walk away with the victory. Crawford tagged his man early in the first. Yet Horn tagged Crawford clean a moment later. Crawford, however, landed the cleaner, more effective punches throughout. Crawford landed a hard left to the body in the second and then started to pick up the pace. Horn, however, was tough and kept moving forward. Crawford began the third landing clean, though Horn was able to land clean himself. Crawford, however, was landing the better shots more frequently. The man from Nebraska was really starting to go to work. Horn kept being a warrior in the fourth, but it appeared that he was being outclassed as the first third of the bout ended. The man did, however, have a good moment in the fifth, when he got Crawford against the ropes. Horn tried to play rough and got a warning from referee Robert Byrd. Crawford then physically rough housed Horn. It had become a one sided affair. By the midway point of the fight, Crawford was continuing to beat his man up. One thing had to be said for Horn – the man was as rough and as brave as they came. At no point through the first seven rounds (which must have been gruelling for the man) did the champion give up or cease to fight with incredible heart. It simply didn’t matter, though. Crawford was simply far too skilled. And still, Horn kept fighting on, trying to land, trying to muscle his man around. It was to little avail. Crawford kept dominating. Crawford exploded late in the eighth, causing his man to stumble. In fact, Horn came very close to hitting the canvas. The brutality continued through the ninth – where Horn finally went down. The champion got back up, but Crawford went right back to work and referee Robert Byrd steped in and stopped the fight. Is Jeff Horn Really a Paper Champ? American boxing fans are yet to embrace Jeff Horn, mainly because they feel that he was gifted a unanimous decision over Manny Pacquaio. 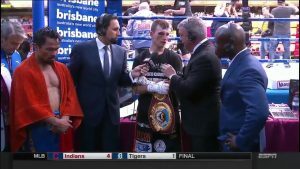 ESPN commentator, Teddy Atlas, nearly lost his mind when Horn’s hand was raised in Brisbane, arguing that he had been rewarded “for trying hard” despite Pacquaio landing “the cleaner punches”. He was so incensed that he even asked Horn himself if he believed that the judges had made the right decision. Most of his colleagues at ESPN shared his disgust, but former world champion Timothy Bradley thought the fight was a lot closer than Atlas’ 116-111 scorecard suggested. It’s worth noting that both Atlas and co-analyst Stephen A Smith gave Horn absolutely no chance of de-throning Pacquaio in the pre-fight build-up. In fact, they were borderline disrespectful. “I’ve got to admit, I don’t have much on this dude,” Smith stated. Surely that’s a key part of his job as a boxing analyst? After admitting that he hadn’t done any background research on Horn, he then questioned whether he even deserved a title shot. Perhaps someone should have informed him that two of the fighters he listed- Randall Bailey and Ali Funeka- were former world champions. In fact, Bailey was a two-weight world champion. Not bad for a no-name. Were these fighters past their prime when they faced Horn? Yes. Had Horn faced particularly stiff opposition up to this point? No. But they might have mentioned that he only had 16 professional fights under his belt. Their ringside coverage followed a similar trend. Even when Horn had his moments, the ESPN commentators barely acknowledged them. Atlas was particularly dismissive, arguing that Horn wasn’t really landing anything when he had Pacquaio on the back foot. In contrast, he erupted when Pacquaio landed even glancing blows. It’s fair to say that the coverage was biased. Horn did a hell of a lot better than expected and Pacquaio looked genuinely puzzled by his awkward style. How could that happen? Just an hour earlier, we were told that this fight was a joke. It seems a little convenient that the same pundits who sneered at his chances prior to the fight described it as a robbery in the aftermath. Perhaps they were trying to save face? After all, running with the robbery narrative meant they wouldn’t have to address their complete under-estimation of Horn. This way they could argue that they were right about Horn, it’s just that the judges were so corrupt. In order to objectively assess the fight, we need to turn to other experts. The CompuBox punch stats don’t do Horn any favours. They show that Pacquaio landed 182 punches to Horn’s 92. However, if you browse through the scorecards of various boxing writers and analysts, you will find that a number of them thought Horn was a deserved winner. Boxing Monthly’s Andrew Harrison said Horn won 116-113, while Sherdog’s Gary Randall (116-112) and Mike Fridley (115-112) said he won comfortably. Irish boxing legend Barry McGuigan and Tom Gray of Ring magazine also felt Horn won the fight by a “wide” margin. 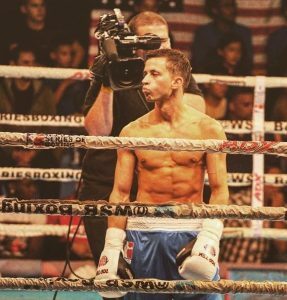 Even popular sports personality and die-hard Pacquaio fan, Skip Bayliss, gave the fight to Horn 115-113. Then there were those who thought it was a draw. Quite a few, as it turns out. But many felt it was extremely close. With so many scores like the above, can we really call Pacquaio vs Horn a robbery? As Iole puts it, fights that only have a couple of rounds in them could really go either way. Especially when almost every round was so competitive. Given how close it was, two of the ringside judges’ scorecards of 115-113 (Horn) are justifiable. The majority of the experts think Pacquiao did enough to win the fight, but it could also be argued that he didn’t do enough to ensure victory. Whether you think Horn won or not, the decision could hardly be described as daylight robbery and he certainly doesn’t deserve to be labelled a paper champ. “The Hornet’s” unorthodox movement and his ability to throw punches from unusual angles made him an extremely awkward opponent. It was widely predicted that the Filipino’s speed, power and relentless flurries would overwhelm Horn. In fact, several experts predicted that he’d be lucky to make it out of the first round. “Pacman” landed plenty of punches, but it wasn’t the dominant performance we anticipated. We’ve seen him completely overpower some of the best fighters of his generation, but he landed surprisingly few power shots, often settling for glancing one-punch counters. Against Horn, he looked slow and surprisingly reluctant to let his hands go. Many blamed father time, highlighting that Pacquaio is every bit of 38 years of age, sustaining a lot of damage throughout a lengthy career. It’s hard to argue with that, but Horn also deserves a lot of credit for Pacquaio’s underwhelming performance. It wasn’t just that Pacquaio has lost some speed, power and stamina. Horn made the legendary fighter look average at times by nullifying some of his biggest weapons. Pacquaio found it difficult to deal with Horn’s size and reach advantage. The Aussie kept him at range extremely well, punishing the Filipino when he burst forward with some solid shots from unexpected angles. Pacquaio looked confused, frustrated and genuinely surprised by Horn’s ability, speed and composure. Horn isn’t renowned as a big puncher, but his power also helped him to keep Pacquaio at bay. How many times have we seen the Filipino stand toe to toe with his opponents, daring them to hit him because he knew that he would come out on top in most of the exchanges. The final punch statistics certainly favoured Pacquaio, but Horn landed some telling blows that backed him up and gave him something to think about. His relatively cautious tactics throughout the fight show that he respected the Aussie’s strength and power. Pacquaio’s hesitation also demonstrates Horn’s deceptive speed. He might not look particularly quick, but his reactions were impressive and he caught Pacquaio where other fighters have failed to in the past. He roughed Pacquaio up too. Critics will tell you that Horn fought dirty and they may have a point. But the head clashes did not appear to be intentional. These things happen in fights and it’s unlikely that there would have been such an outcry if Pacquaio used similar tactics. Horn did what he had to. When Pacquaio did manage to work his way inside, Horn used his physical advantages to great effect- smothering him, leaning on him and making him feel every bit of his weight. Few fighters in the world can box their opponents effectively from range and close quarters. Most fighters favour one approach over the other. Horn managed to do both against an all-time great. People have criticised his style, but any fighter that can pull this off is extremely skilled. All of these things are well and good, but we have to acknowledge that Horn was almost stopped in the 9th round. If an older Pacquaio almost finished him, he surely has no chance against Crawford, right? Maybe. But anyone who can absorb such a vicious attack from Pacquaio is clearly a tough nut to crack. How many people have taken that many shots from Pacquaio and stayed on their feet? Sure, Pacman’s lost some of his legendary power, but he still had enough to floor two world class fighters in his previous fights- Jesse Vargas and Timothy Bradley. Horn didn’t just take that punishment and survive. He won the last few rounds. It’s clearly going to take something special to put him away. Let’s also not forget that Horn came to boxing late (aged 16). With just 19 fights under his belt, he is still relatively inexperienced and has shown improvement in every fight. He will only get better. Look at the other world champions in Horn’s division. How many of them fought someone of Pacquiao’s calibre in just their 18th professional fight? None. –	Keith Thurman became interim WBA champion with a win over Diego Chaves in his 22nd fight. –	Errol Spence beat Kell Brook to become the IBF champion in his 22nd fight. –	Lucas Matthysse took a whopping 35 fights to become the WBC champion, defeating Mike Dallas Jr. Even Crawford became the WBO Lightweight Champion in his 23rd fight, a unanimous decision against Ricky Burns. Did Horn lose to Pacquaio? Possibly. But many experts felt it was a lot closer than Teddy Atlas’ scorecard. Plenty also felt that the Hornet did enough to get his hand raised. Don’t let the robbery narrative fool you, the man can fight. Expect to see an even better version of Horn this weekend. Many people feel Crawford is taking an easy path to a world title by facing Horn, but he may not have it all his own way. If you think Horn’s an easy fight, you haven’t been paying attention. Crawford will need to be at his best to put him away. Regardless of the result, Horn deserves far more respect than he has received thus far. This afternoon, ESPN boxing commentators and analysts Joe Tessitore, Mark Kriegel and Tim Bradley discussed the June 9 super fight between Terence Crawford and Jeff Horn. Crawford vs. Horn and José Pedraza vs. Antonio Moran will stream live exclusively on ESPN+ (in the United States) this Saturday, June 9 beginning at 9:30 p.m. ET/6:30 p.m. PT. 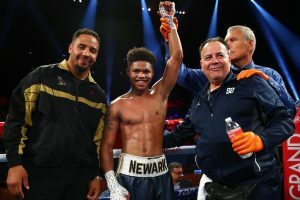 The entire undercard, including Shakur Stevenson, Steve Nelson, Jose Benavidez, and Gabe Flores Jr. will stream on ESPN+ beginning at 6:30 p.m. ET/3:30 pm. PT. 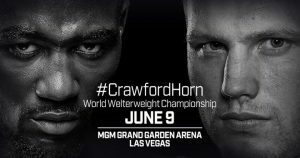 For more details on ESPN+’s coverage for the Crawdford vs. Horn fight, click here. Below is the transcript from the call. THE MODERATOR: Hi, everyone. Thank you for joining our conference call with ESPN boxing commentators and analysts Joe Tessitore, Mark Kriegel, and Tim Bradley to discuss this Saturday’s super fight between Terence Crawford and Jeff Horn. Crawford and Horn will battle for the WBO Welterweight World Title streamed live on ESPN+ in the United States along with the entire undercard, which includes Jose Pedraza, Antonio Moran beginning at 9:30 p.m. Eastern. Following will be Shakur Stevenson, Aelio Mesquita, Jose Benavidez, Frank Rojas, and other undercard bouts beginning at — on ESPN starting at 6:30 p.m. Eastern on ESPN+. With that, I’ll go ahead and open it up for questions. Q. Tim, (indiscernible) how do you think it will pan out? TIM BRADLEY: How do I think the fight will pan out? TIM BRADLEY: What’s that the question? How I think the main event’s going to pan out? Q. The main event, yeah. TIM BRADLEY: Yeah, how do I see the fight. Yeah, I’m trying to understand. I’m waiting on a response. But anyway, how do I see the fight going? Well, I see the fight starting off kind of rough, honestly. I think Horn, being a bigger guy, likes to move in quick, likes to get inside early, likes to work the pace and dictate the pace. I think he’s going to try to close the gap on Terence really early and show him that, hey, this is a different weight class, this isn’t 140 pounds now, this is a different weight class and different type of weight. I think he’s going to try to push Terence back. Honestly, I think he is. I think Terence is going to struggle in the beginning only until he finds his rhythm. Once Terence finds his rhythm, meaning Horn’s rhythm, then I think things will open up and Terence can control the distance from the outside and time Horn as he comes in. At the end of the match, I think it’s going to be Terence Crawford with his hands raised. I think that Horn will put up a good fight, but I think Terence Crawford has too much precision, too much boxing IQ. He’s a great counterpuncher. He can punch in between shots. There are just so many dimensions to him as opposed to a guy like Jeff Horn. Q. (Indiscernible) were you impressed with him? JOE TESSITORE: I was. I’ll tell you, Timmy and I were down there ringside in Australia. My big takeaway with Jeff Horn — and then Mark and I had the pleasure of calling his title defense in December as well, but my big takeaway of being with him in person in Australia, covering his title fight in December is that this is a very sturdy, rugged, mauling kind of guy who is going to put forth a physical presence. He is going to always try to do things on his terms. I completely agree with the champ’s assessment as to what this fight is going to look like early. 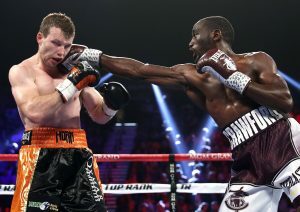 I will add on that although I think it’s easy to fall in line with the camp of saying Terence Crawford, too much skill, too much boxing IQ, too much raw athleticism, and elite status; that this is a guy in Jeff Horn who is very, very tricky and makes a fight out of a fight. When we were there ringside, and I know for those who watched back in the States, they felt a certain way about the outcome of that fight last summer, we didn’t have the same feeling sitting there ringside. We saw a mauling, physically imposing, very big welterweight who I almost questioned how he possibly gets to 147 pounds. And because of that, I think this is a fascinating fight, first and foremost. Because when I look at the records next to the two names, I see two zeros in the loss column. MARK KRIEGEL: We said much the same a year ago about Horn versus Pacquiao. I think that in terms of the disparity of size, experience, skill level — experience and skill level, that at the end of the day I think that it was Horn who made us aware that Manny was coming up against the limits of his size and his age. All that being said, in regard to Tim’s point, and I’ve watched Crawford now spar with big guys, 178-pounders, I think that once he does find his rhythm and the timing, the punch that will cause the great damage to Horn will be the right hook. Almost like a check hook when he’s on his way in. But that’s the one shot that I’ve seen him sparring bigger guys with. Q. In regards to Jeff Horn, do you think that Terence Crawford fight is going to be a tougher fight than the Pacquiao fight? JOE TESSITORE: Yes, is this fight going to be tougher than Pacquiao is the question? TIM BRADLEY: For Horn? I agree. I believe that this fight will be a tougher fight than Manny Pacquiao because there is so much more dimensions to Terence Crawford than to Manny Pacquiao. You know what you’re going to get when you fight a guy like Manny Pacquiao. He’s coming to get you. Terence, on the other hand, is multi-dimensional. So he can make adjustments on the fly without his corner even telling him to make adjustments. I’ve had the opportunity to have two training camps with Terence Crawford before Terence Crawford became — before anybody knew who he was. One of the things that I took from him during that training camp was that this is a kid that flew down here by himself to my hometown, came (indiscernible) without a coach, without a trainer, getting fed a little bit of information about myself, gets in the ring, basically puts on a show. Beats me up in front of my own people — beats me up, comes back the next day. I come back with a plan. He comes back and completely — he comes back and he’s a completely different fighter than he was the day before. And he kept making adjustments, and he kept making adjustments on the fly. So this guy, Terence Crawford, is going to be tough, a tougher fight, in my opinion, than Manny Pacquiao. MARK KRIEGEL: Another thing to bear in mind is that Pacquiao has seen better days. He’s not — he’s at the far end of his prime, and Crawford is just entering his. I don’t think we’ve seen close to what the best Terence Crawford we can get. JOE TESSITORE: I don’t think it’s even close. 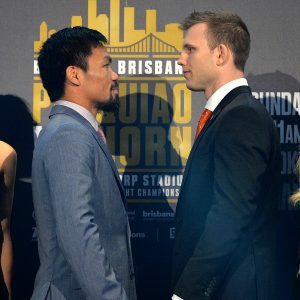 I think Pacquiao in so many ways was the perfect storm for Jeff Horn with everything timing up just right, and that is not the case here in coming to the Vegas fight with Crawford. It doesn’t mean in any way I’m dismissing Jeff Horn as a live dog here, as much as I understand that this is the biggest mountain that he could possibly be asked to climb compared to what he just did last July. TIM BRADLEY: I mean, completely two different styles. I’ll give Horn the benefit of the doubt, because what he was able to do Against Manny Pacquiao, I haven’t seen anybody be able to dominate him and bully him the way he did. And when I say dominate, I just mean in the physical form. You know, he pushed him back. He was grinding there, and he was very dirty at times. He had Pacquiao’s back against the ropes and he was working him. I haven’t seen that — a guy do that Against Manny Pacquiao at all, and he was able to do that. With that being said, this is a completely different guy. Styles make fights. Terence can fight from the forward and backing up. Terence can switch left-handed and he can go right-handed. He can knock you out with his left hand and his right hand. This is a kid that can make adjustments on the fly. He has a high IQ. If you watch the replay with him and Indongo, you will see Terence punch in between punches. If Horn comes rushing in with wide shots, I’ve sparred him, it’s dangerous. It’s dangerous for Horn. It’s danger. That’s all I’m going to say. Q. Tim, if he does pull the upset, what’s that mean for Jeff Horn? Does he go down as one of the greatest fighters in the world right now? TIM BRADLEY: If he beats Terence Crawford would he go down as the greatest fighter in the world? I don’t know. He’ll be a top guy, yeah, absolutely. He’d be top three. Top three or four, top five. I know he’d be pound-for-pound then, absolutely. Because in order to be pound-for-pound, you’ve got to beat a great fighter. Terence Crawford, however you put him, number one, number three, he’s in the top five pound-for-pound in the world. If you beat a top pound-for-pound fighter in the world, guess what? You’re top pound-for-pound now. JOE TESSITORE: I didn’t get the name of the journeyman writer who just asked that question there, and we appreciate that question, because I think it exposes one of the deep veins that runs through this fight. That is that the Jeff Horn side still looking for and demanding respect, especially stateside. This is an undefeated, welterweight champion at the end of the day who conquered a living legend, defended his title, and now has a willingness to come to America and take on our best pound-for-pound fighter. That’s what Terence Crawford is. He is American-born, best pound-for-pound fighter, where you have Vasyl Lomachenko number one, as our network does, or whether you go with a guy that’s now a three-time Fighter of the Year between ESPN and the Boxing Writers of America in Terence Crawford. If Jeff Horn wins this fight, you know the thing that matters most in this sport? Results. He would have had two signature wins, including a victory over arguably the best pound-for-pound fighter in the world. So, yes, he would be — he would have that respect, and he would be thought of in that way. Even though there will be critics that look at him and see commonplace, ordinary, straightforward, thudding, bullying, not prettiest, not the most athletic, he would be that because the results deem him that. So, yes, he wins this weekend, that’s what we will say of him and that’s what he will be. Q. Bradley, I followed your career for a very long time. Thought you had a very wonderful career as a boxer and now commentator. In terms of for Jeff Horn, you know, you’ve kind of been in a similar situation with Manny Pacquiao how you had to prove that you belonged in the ring with him. Obviously you got that win in the first one and obviously had to prove that again with the next fight. 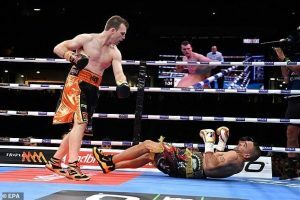 Do you feel that Jeff Horn is going to be in a similar position even though he’s the champ, he’s going to have to show that he deserves respect? Because a lot of people thought that first Manny Pacquiao fight was controversial. Do you feel that he is in the same situation as you? TIM BRADLEY: Absolutely. He’s in the same situation as I was similar. A lot of people felt that I didn’t win the first fight against Pacquiao, but I felt I did win the fight and everyone around me thought I won the fight. But at the same time, Jeff Horn, he’s pretty new to me, in my opinion, to America. You know what I mean? Very known in Australia and everything and what he’s done by beating Manny Pacquiao, but he still has a lot to prove. He’s taken his step up fighting against like Tess said, the best American, number one, pound-for-pound in the game. Now, he beats a guy like Terence Crawford, I mean, you know, this is a guy that needs to be respected. So, yes, he still needs to gain everyone’s respect by him coming to America to defend his title in Las Vegas, it shows you that he wants to be great. It shows you that he’s willing to take that challenge and that step up and wanting to be great. So, absolutely. He needs to continue to prove himself. Just one fight doesn’t justify your career. It’s all the other fights in between as well. It’s the fight after he won the championship Against Manny Pacquiao, you know? It’s the next fight after this one, you know what I mean? That’s what defines your career. Not one fight. MARK KRIEGEL: If Horn takes it as personally as Tim did, the lack of respect he got from beating Pacquiao, we’re in for a hell of a fight. If you look at how Tim reacts and how personal and the desperation with which he came out, not from winning but from not getting his respect, if Horn brings something like that, we’re in for a hell of a night. JOE TESSITORE: I think there’s something also interesting with this fight in that we keep talking about how Jeff Horn wants to get the respect here stateside because of how the outcome was viewed by American fight fans. But let me tell you something about Jeff Horn, and we’re seeing it true already early on this week with now the promotion of this fight here in the U.S., as, Mark, I’m thrilled to see your feature piece, excellent feature pieces, leading off ESPN.com, and I’m sure will be read by so many mainstream sports fans, not just the endemic boxing fan. 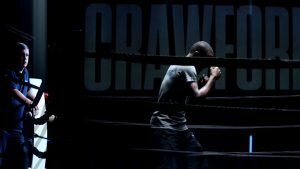 It’s an excellent piece I would recommend, especially our Australian friends, to get your hands on on ESPN.com, Mark Kriegel’s feature piece on Bud Crawford. But Jeff Horn, as much as he has not earned the respect of American fight fans, they are very aware of him. He’s notable. 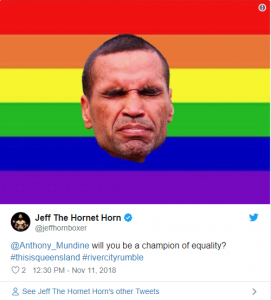 In fact, you could make a strong argument that more mainstream sports fans, non-boxing fans know exactly who Jeff Horn is than know many of the pound-for-pound best fighters in the world, including American fighters like Errol Spence or Keith Thurman. Because last year when he fought on Saturday night and the shift in the business of boxing, the paradigm shift happened, and that fight was on ESPN pre-TV compared to being stuck in the corner of Pay-Per-View the way it normally would be for a decade and a half of Manny Pacquiao, so many mainstream sports fans experienced Jeff Horn’s Rocky Balboa moment. So there was buzz. All you have to say to somebody now is, hey, Jeff Horn, the guy who beat Pacquiao last summer is fighting Bud Crawford, they know instantly who Jeff Horn is. Respect, different story. Awareness, very high. For this fight, however, Crawford isn’t going to let himself underestimate his foe. “Preparation’s been A1,” Crawford said on the call. “We had a tough training camp. We didn’t take any shortcuts.” I asked the fighter if his camps have been easier now that he’s been steadily moving up in weight. “It’s always the same,” he replied. “Camp ain’t always easy …if camp is easy, your trainer’s doing something wrong…camp should never be easy.” Crawford also made it clear that Saturday’s bout is particularly important to him. Horn, after all, won his title (albeit controversially) against the great Manny Pacquiao. Horn, of course, has other ideas. “I’ve been working very hard in the preparation for this fight,” the Australian said during his portion of the call, adding that he was now “starting to taper down for the fight” itself. Saturday will be Horn’s first fight in America, something that some may consider a surprise, considering Horn’s level of competition this weekend. “The money was right,” Horn said simply of the decision to fight stateside. “We were always thinking we were going to America anyway.” I asked the WBO champion if he was prepared for the famed adjustments Crawford is known to make in the ring. Horn replied that he was planning on spending the match staying one step ahead of his foe. “I’m hoping he can’t figure me out throughout this whole fight,” he added. “That’s the plan, to keep changing things up.” Horn’s trainer, Glenn Rushton, expressed his wish that team Horn be allowed to engage in the kind of fight they want to. “We’d like to see the fight flow freely,” the corner man said. Promoter Bob Arum made it clear early on in the call that Horn was coming to win. “He’s not coming to just make an appearance,” he said to reporters. On paper, this June 9th clash from the MGM Grand in Las Vegas is a good fight. Jeff Horn is a confident and undefeated world champion making his second title defense. Confounding all doubters, he dethroned the fearsome hall-of-fame legend Manny Pacquiao in July of last year by resolutely sticking to his blue-collar game plan. Horn (18-0-1, 12 KOs) is bulldog tough and has never been stopped. Terence “Bud” Crawford is a two-division world champion with an impressive professional resume, and he is looking to win a third championship in the always fascinating welterweight division. Crawford (32-0, 23 KOs) is a formidable talent who moves brilliantly, lands punches accurately from all angles, and is as crafty and smart as they come. Despite the matchup on paper, however, Jeff Horn has a big – perhaps impossible – bridge to cross. Here, in decreasing likelihood, are three scenarios for the fight, as I see it. First, Crawford simply outclasses the Australian champ, opens a cut and we have a TKO in the fourth or fifth round. In this scenario, Crawford takes one round to figure out his range and his opponent’s movement, then he starts to set his traps and lure Horn in, and Horn does like to be the aggressive pressure fighter. This will play into Crawford’s strengths, which are hand speed, accuracy, and overall ring savvy. Once he has Horn hurt or cut, Crawford’s killer instinct will end the bout. Or, Horn will walk into something, à la Julius Indongo in Crawford’s last outing. In our second scenario, Crawford wins on points by boxing from range, switching hands, and overall technical proficiency. The looping punches and hay-makers that Horn threw in the Corcoran fight will not be productive. Crawford is too slick defensively to be caught like that, and he is quick to punish mistakes. Horn has never faced anyone with Crawford’s movement, especially his in-and-out distance control. Horn will spend the night trying to establish his inside game, but Crawford’s footwork won’t let him. If Crawford can land punches from range, he will score points and most likely goad the proud Australian into opening up. Third and least likely, Horn uses his size to bully and muscle Crawford, making it an ugly, phonebooth fight. The WBO champ can be formidable when he bulls forward with his chin tucked to his chest and throws blind hooks. Horn can also be reckless with his head, to be put it politely. But Crawford is no rookie, and he won’t fight inside unless on his terms. Even in this scenario, I don’t see Horn winning on points in front of a panel of American judges. He is going to have to do something special to break down and defeat a fighter of Terrence Crawford’s caliber. Unfortunately for Horn, the man from Omaha, Nebraska, is bridge too far. Which of these scenarios, if any, will come true? We will see next Saturday night, live on ESPN+. How do you see the fight turning out? Please leave your comments below or continue the conversation on Twitter (@lungee77). “If I truly, honestly believe it, from my judgement and my experience in the game of 40 years, I feel that I should do that,” says Atlas. 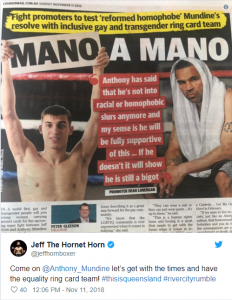 In an interview with the Daily Telegraph, Horn’s promoter, Dean Lonergan, said that Atlas is the primary reason that Americans view Horn’s upset victory over Pacquaio as a “robbery”. Atlas says he is aware that Horn’s camp was furious with his comments, but feels it was important to be honest with the Queenslander rather than pretending that he agreed with the decision in their post-fight interview. “I wanted to be consistent with what I feel and tell him. I didn’t want to say behind his back what I just said, that he lost, and then in front of him say hey buddy, you did great and I thought you won,” he says. “I thought that’s phony and that’s not what I want to do. I know a lot of guys on tv and radio don’t do that, they destroy somebody and then they interview them face to face and say hey buddy you’re the best,” Atlas says. He says his intention was to stand up for Pacquaio and denounce a poor decision by the judges rather than personally attack Horn. In fact, Atlas was impressed with Horn’s performance even though he feels that Pacquaio landed the cleaner punches. “Listen, Horn fought a tough, gritty, game, determined fight in front of his countrymen. There’s no way you can take anything away from that,” according to Atlas. “I never denied that, I said he behaved like a champion and congratulations on behaving like a champion and fighting like one,” he says. “But I wanted to do it graciously, like a gentleman and say I thought you lost. It’s not like I stomped him with it. It’s not like I was being mean-spirited about it or over the top, I just wanted to get out there what I had just said that he wasn’t privy to,” says Atlas. Although Horn showed terrific heart and gave Pacquaio a much tougher fight than expected, Atlas says there’s no point in shying away from the fact that he felt he lost. “Like I said, you don’t get credit just for throwing, you’ve got to land. Manny landed the cleaner punches in that fight. He should’ve got that fight,” he says. Whether you think Horn won or not, Atlas says dodgy decisions have plagued boxing for decades and he feels that it his duty to call out incorrect decisions, corruption and incompetent judges. “I thought it was just another injustice of scoring that we see too often in boxing. It just burns me, it really does. It’s like we get numb to it after a while and say ok that’s boxing,” he says. “No it’s not ok, it’s wrong. Unfortunately we see a lot of wrong things in boxing sometimes. The sport is great, I love it. The administrators of the sport, sometimes they stink,” says Atlas. Given his strong views on Horn’s famous victory, it’s no surprise that Atlas doesn’t see him beating the highly-rated Crawford on the 9th of June. ESPN, meanwhile, has given no indication that it plans to remove Atlas from its commentary team for the fight. “I didn’t think it was controversial at all. Jeff won that fight 100%,” he says. Murphy has been involved in the sport since 1973 and his self-named “Murphy’s Boxing Gym” has produced some of Australian boxing’s biggest names, including Commonwealth Games Gold medallist Brad Pitt and two-time Presidents Cup Bronze medallist Trent Rawlins. Murphy says he knows a bad decision when he sees one because his current star, WBA (Oceania) Middleweight Champion Tej Singh, has been on the wrong side of a few. “He has four losses on his record and every single one of them, he has won. So people underestimated him and didn’t realise how good he was,” according to Murphy. 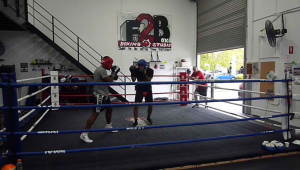 WBA Oceania Middleweight Champion Tej Singh (middle) in sparring action with Gerry Murphy (right) watching on. He feels that Pacquaio can have few complaints about the result as Horn boxed a smart fight, using his size and tenacity to wear the Filipino down. He questioned Pacquaio’s conditioning, pointing out that he could have stopped Horn, but didn’t have enough in the tank to put him away. “I don’t think Pacquaio rated Horn and I don’t think he trained for that fight,” Murphy says. 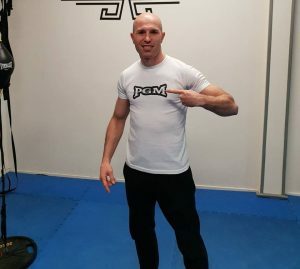 Predrag Galic, who has produced state and national champions in Boxing, Kick-boxing and Muay Thai out of “Prestige Gym” in Melbourne, agrees that complacency was Pacquaio’s greatest enemy. “The guy was not prepared. From what I understand he did not train as hard as he should have,” he says. He says peoples’ judgement of the fight has been skewed by the damage he took in the 9th round, when Pacquaio hurt him several times with a barrage of lethal combinations. “I think a bit of the controversy came from the fact that he was nearly stopped. He got hurt late in the fight, but you can’t score a fight on one or two rounds,” he says. Whether you feel that Horn deserved the decision or not, Galic says no one could deny that he put on a fantastic performance against one of the best fighters of his generation. “Controversy aside the guy stood there and fought,” he says. “Regardless of the decision, for Horn to perform so well against a fighter like that and a southpaw, which would have been uncomfortable for him, I give him a lot of credit,” Galic says. Although Pacquaio was a huge scalp for Horn, both trainers feel that Crawford represents the biggest challenge of his career. Murphy has some inside knowledge on the former light-welterweight champion as his fighters watched Crawford spar at a training camp in Colorado. “The whole Australian team watched him spar at a camp in Colorado and they said he was phenomenal. They said he was almost magical to watch,” he says. “I think they’re making a bit of a mistake in fighting Crawford now. I would’ve given him a couple of more winnable fights first,” Murphy says. “They said Crawford’s up there with Lomachenko. I don’t think Jeff can beat him,” says Murphy. “Crawford’s a little bit shorter but he has a reach advantage. He is a very swift counter-puncher who covers 180 degrees, whereas Jeff Horn covers slightly past 90,” he says. “Crawford is a volume puncher with a longer reach and a 70% knockout ratio. He’s very dangerous,” Galic says. “I hope Jeff Horn’s team have looked at that and addressed it in training, otherwise they could be surprised,” according to Galic. Regardless of the outcome in Las Vegas, Murphy and Galic believe Horn is a great example for young athletes around the world. Galic tells a similar story, recalling how Horn was so pleasant with all of his fans at a Golden Gloves event and that his newfound fame doesn’t seem to have gone to his head. “if he really was lucky against Pacquaio, the next few fights will show it,” he says. Horn will get the chance to prove his doubters wrong again in just a few weeks.